Children's Hospital at Erlanger is a proud member of Children’s Miracle Network Hospitals, an alliance of 170 premier children's hospitals in North America. The network’s vital mission is to increase funds and awareness for local children’s hospitals. Did you know that more than 90% of Chattanooga–area children diagnosed with cancer are treated right here at Erlanger? Patient ambassadors for each Children’s Miracle Network Hospital are known as Miracle Kids. In our region, Miracle Kids represent the healing work of Children’s Hospital at Erlanger. Each year, nurses, physicians and other staff from all areas of Children’s Hospital nominate patients they believe are true miracles. 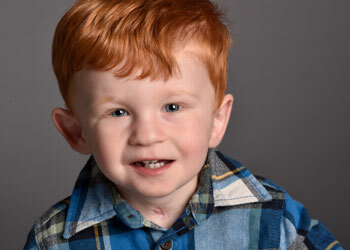 These are children who have battled bravely and overcome the odds. They display a unique spirit that touches lives all around them. It is our joy to add to our Miracle Family each year and our pleasure to share each child’s amazing story here.